James Hardie has been lauded as one of the best, most-innovative building material companies in the nation. Hardie fiber cement siding is intelligently designed to last against all of nature’s elements for up to 30 years. With the HardieZone System, siding is engineered to last through the climate in which your home is located. And, with Hardie ColorPlus Technology, you can purchase siding that has been painted with a factory applied paint finish. This siding has been especially created to last in the climate that your home is located in. In fact, ColorPlus Technology finishes are warranted for 15 years to ensure that you’re getting the best quality of siding. Industry leaders have also dubbed James Hardie as a “green” company for creating environmentally conscious, sustainable products. Click through the interactive menu below to learn more about James Hardie Products available in Michigan. Don’t waste any more time looking for a James Hardie preferred contractor, because Bloomfield Construction offers plank, shingle, panel, board and batten, soffit, and trim products all from James Hardie. We will install James Hardie siding on any home, because we have full confidence in its quality. In fact, James Hardie was ranked as No. 1 return on investment in the Remodeling 2012-2013 Cost v. Value Report. 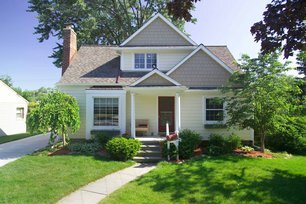 Get the best option for your siding needs at Bloomfield Construction.